← How to use Flipbook Maker Pro together with Advanced PDF Page Cut? How to stitch PDF pages into one and make flipbook? If you are VeryPDF Flipbook Maker Pro user, you will find that we give four other software as gift. One of the software named PDF Stitcher, which can be used to stitch multiple PDF pages into one PDF page. But you may wonder why we bundled them together and how could you take full advantage of those two software together. In the following part, I will try to give you a way about how to use them. Download Flipbook Maker Pro and download PDF Stitcher. Both of those two software are GUI version, you need to install them. When downloading PDF Stitcher, please make sure that you download the right version as there are two version:Mac and Window. Once the downloading finishes, please double click the exe file and follow the installation message. The installation can be finished in a few seconds. Once the installation finishes, there will be icons on the desktop. Simply click then icon then you can launch software. Step 2. Stitch PDF pages and make flipbook. 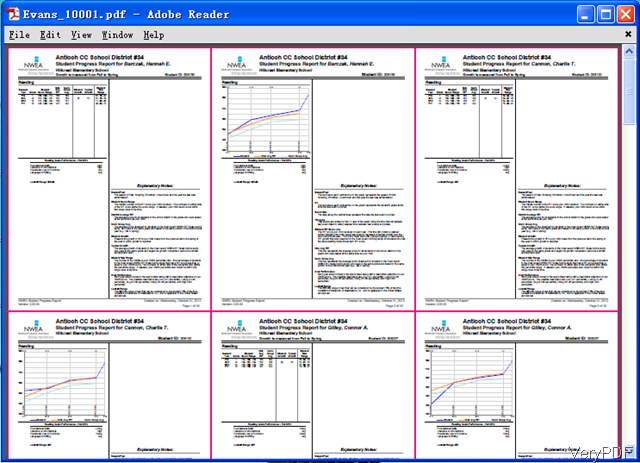 The following snapshot is from software PDF Stitcher. Once you open it then you will know how to use it. Please add PDF files to software interface by dragging or clicking button Add. Please do not be confused that this softare only can be used to merge pages from one PDF file to a new sheet. It is totally different with software PDF Merger. When finish adding files, please choose pages per sheet and set Gutter and margins. And the order of merging pages in the sheet. Once this part has been finished, please click button Setting to set other limitations. In the Setting menu option, you can choose page range and choose line color of the Gutter. When this step has been finished, please click button Start to run the conversion. Now let us check what kind of output file would be. Many pages will be shown in one sheet. This method is extremely good when you need to make flipbook from illustrations with corresponding text explanation. Or you make flipbook for showing comparative result. When you finish this step, you can launch software Flipbook Maker Pro version to make flipbook by those merged PDF files. During the making, if you do not know how to use software Flipbook Maker, please searched usage in our knowledge base or refer to our user guide. By this method, you can make flipbook from hundreds of pages PDF document. And you do not need to worry that the output flipbook size is huge. And you do not need to compress the output. If you need to print the flipbook, please print them after stitching. During the using, if you have any question, please contact us as soon as possible. How to make html5 flipbook which shows small thumbnails of page spreading underneath? How to use Flipbook Maker Pro together with Advanced PDF Page Cut? What's a good free program for creating wedding reception slideshows? How to make slideshow from screen shot free? This entry was posted in Flipbook Maker and tagged make flipbook, stitch PDF pages. Bookmark the permalink.